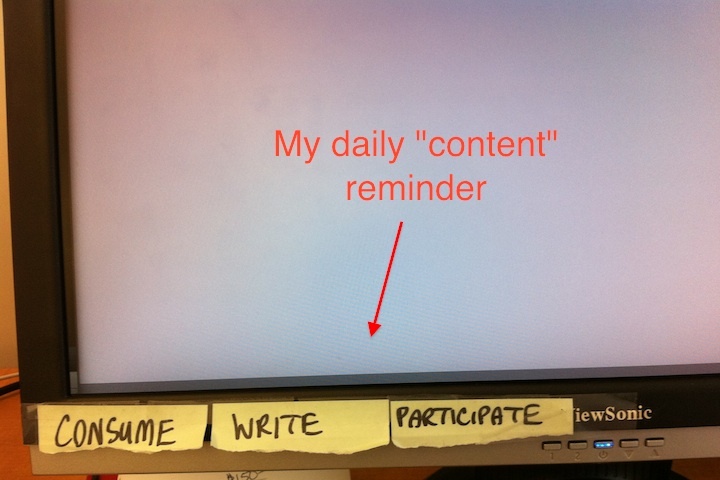 I have three words taped to my monitor as you can see in the picture below. They are all meant to be daily reminders for me personally. Consume. Read, read and read some more. Always stay up on what’s happening. Google Reader and Instapaper, thank you. Write. I try to express my thoughts on this blog as much as possible. Sometimes they are shorter posts like this one and sometimes they are long, winding stream of consciousness posts, but they are my thoughts and I love sharing them and having discussions with people. The discussions are what fuel me. Participate. This is the hardest one to make time for but to me, the most important. It’s why I’m interested in Quora and why I try to comment on other blogs as much as possible. Participating in conversations, whether they are on your blog or others, is what the web was made for.